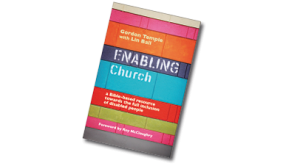 The first Enabling Church conference was so remarkable and inspiring it prompted Gordon Temple (Exec Officer of CfA and then CEO of Torch Trust) to consider authoring a book. In a writing partnership with Lin Ball, an established author, they produce Enabling Church, published by SPCK in 2012. It’s a resource book, divided into 7 sections to support church, group or individual study. You can order from bookshops and online. It’s also stocked by Torch Trust and Through the Roof.